Guest post on The Agile Executive by Anne Gentle about applying agile methods to non-coding tasks, in this case the writing of documentation. XBRL (eXtensible Business Reporting Language) is a data standard for electronic interchane of business data. Soon to be adopted by HMRC as the mandatory format for submission of UK Company tax returns. This is the fifth post in a series of thought experiments on applying Lean/Agile principles to the early shaping stages of a programme. In previous posts I have talked about the application of the ideas of flow and a value stream to programme shaping, and touched on sources of “waste” in the typical programme environment. Again borrowing heavily from the Poppendiecks for my conceptual structure, I want to think about learning in our context, and how we can make it work better. As we learn more about these areas we progressively build and refine our product – the design of the programme as a system. This sort of learning process can be likened to the Deming Plan-Do-Check-Act cycle (PDCA). Frequent feedback from stakeholders. Look at physical proximity (e.g. where the team sits), access to diaries, collaboration technology. A central challenge to effective consensus building comes from the intangible nature of the concepts under discussion and the relationships between those concepts. Approaches that offer visual modelling to support rapid understanding of conceptual relationships, supported by the right blend of numerical and textual “backing information” to support deeper understanding and analysis are helpful here. In my experience a visual meta-model of the programme shaping artifacts is also a useful tool to clarify the dependencies between different outputs. Published methodologies such as MSP are often (or are often interpreted as) document heavy. The work to synchronise work products expands exponentially with the number of separate but inter-dependent documents. Following the lead of others (sorry no references to hand) I find it helpful to think of different programme documents as merely different views into the programme model. Actively simplify the document set, don’t just produce every document that is listed in your favourite (or mandated) methodology). For each document ask yourself what question that document answers, or what decision it supports. If you can’t answer, then you may well not need it. Adopting this approach successfully may require active engagement with, and influencing of, the”quality police” – PMO, Internal Audit etc. Model the documentation set to clarify dependencies between documents. The systems design principles of high coherence within a document and low coupling between documents are a good guide. If all you have is Visio, then that’s better than nothing, but I’ve found that a UML modelling tool can be very useful in this regard. If possible, automate production of documents from a common source. For example, with the right modelling tool it may be possible to auto-generate some documents, moving a step towards the nirvana of an all-encompassing data repository. Use a version control system to track document history and tag consistent sets of documents. My personal preference is Subversion, as it is free, available on several platforms, well-known, and supported by a number of tools. In the initial stages of programme shaping there may only be one or two people involved, so keeping the work in sync is often “just” the problem of keeping the document set consistent. Once more than a couple of people are working on the idea then it becomes increasingly possible for the work to diverge, increasing the risk of re-work being needed. Until someone invents automated integration tests for programme documents we are faced with using the design of our shaping process to keep the work on track. Taking a set-based approach to solution design. For example if you had a team working on high-level technology decisions for the enabling projects working alongside another team looking at organisational decisions, encourage each to maintain a set of options in their design. As the programme shape firms up, each team can narrow their options. I’d be interested in dialogue to sharpen these ideas, do please comment below! This is the fourth post in a series of thought experiments on applying Lean/Agile principles to the early shaping stages of a programme. In the last two posts I started to explore how we could find the value stream in the “messy” stages of early programme shaping. In this post I will turn to the concept of “waste” in our context. How often have you found the situation that a critical piece of information is held by one person, and that person is in another department, or another building? e.g. Plans which do not fit strategy, products which do not stakeholder expectations, or inconsistency between documents. I’m sure that each reader will be able to add their own examples. In later posts I’ll look at possible solutions. Next – how do we design the programme shaping process to amplify learning? This is the third post in a series of thought experiments on applying Lean/Agile principles to the early shaping stages of a programme. In the previous post I started to explore how we could find the value stream in the “messy” stages of early programme shaping. Before I go on to explore the concept of “waste” in our context, I want to say a bit more about the value stream. The key outcome of the programme shaping process is a clear understanding of the “Why”, “What”, “How”, “When” and “Who” of the programme. Different methodologies have different names for products that address these questions, and sometimes different names for the products at different stages of their development. For example in MSP 2007, in the pre-programme and Initiating a Programme stages, most of the key questions are addressed (in outline form) in the Programme Mandate and Programme Brief, but during Programme Definition these expand into products such as the Blueprint, Benefits Maps, Benefits Realisation Plan, Project Dossier, Programme Plan, Programme Definition and Business Case, not to mention the planning and documentation around programme governance. Regardless of the particular nomenclature, the process is one of iterative discovery and design. What we are doing through this time is architecting the “programme as management system” – the system goals, the programme “engine” and the feedback/control mechanisms. So the challenge to find a Lean approach to programme shaping is the challenge to find a Lean approach to designing a management system. In the next post I will explore the concept of “waste” in our context. This is the second post in a series of thought experiments on applying Lean/Agile principles to the early shaping stages of a programme. Here I am using “programme” in the widest sense – to borrow a definition from MSP2007 “ a temporary, flexible, organisation created to coordinate, direct and oversee the implementation of a set of related projects and activities in order to deliver outcomes and benefits related to the organisation’s strategic objectives ”. The core of all lean approaches is to identify the value stream – what activities take place to generate value from the process. For example, in software development, what sequence of activities has to happen to create production applications which deliver benefit to the customer? So how do we map that to the early, often “messy” stages of a programme? What challenges does the organisation face, and what objectives will it adopt? What areas of change would make good programmes? What would a specific programme address? What specific benefits will the programme deliver? What does the programme have to do to deliver the benefits? Many commentators would suggest that (1) is the province of strategy development and that (2) is the realm of Portfolio Management, but for the moment I’m going to elide them together – I’m trying to find the flow of value rather than establish discipline boundaries. Having said that, most of us who get involved in programmes can usually only monitor (1), so I think there is a fairly natural (albeit fuzzy) line between (1) and (2). In terms of the programme shaping flow, we can start to see a series of intermediate products at increasing levels of detail, requiring increasing investments of time, money and resources, and which eventually (should) generate benefits that flow back up the tree. Before we can identify the value chain associated with all this activity, we need to determine how the organisation will assess value. It seems to me that the clue is in the definition of what a programme delivers – “outcomes and benefits” – and the key to evaluating those is benefits realisation management. It won’t surprise anyone when I say that in my opinion benefits mapping and related analysis is at the heart of an effective portfolio and programme process. So the second clue about finding the value stream is to focus on benefits at each stage. The third element is to decide how we recognise “good” quality at each stage – i.e. something that delivers value to the stake-holder. Sadly, we have no equivalent of the software world’s automated unit, integration and user tests for programme artifacts, so we need to turn instead to guidance such as MSP 2007 Appendix D “Programme Health Checks”, OGC Gateway reviews, or any other audit and evaluation approach used within an organisation. To optimise our value stream we have to optimise the flow of our work products through those constraints. In the next article I’ll start to explore the concept of waste in our context. This is the first of a number of exploratory posts to express and refine my thinking on the subject. I want to pull together a selection of experiences with programme shaping by looking at them through the filter of lean/agile theory. Traditionally programme management, especially in public sector, is heavily influenced by stage gates. Having said that, the authors of more recent methodologies (e.g. MSP 2007) recognise the need for iteration and conceived a “transformational flow” of work that delivers benefits over time. The area that I am particularly interested in exploring is the shaping stage of a programme – the early part of the process when the stakeholders come together to agree the benefits to be achieved, the shape of the organisation after the change, the set of initiatives that will be needed, and the business case. I see strong parallels between programme shaping and the world of software development – both are dealing with the development of concepts, and the progressive discovery of knowledge about the area of concern. So I freely acknowledge that my thinking is heavily influenced by pioneers in the field of software development such as the Poppendiecks and David J. Anderson. Of course the challenge in drawing lessons from a different field is not just to find the translation, but to recognise where the concepts differ, so I would expect that my views will move around as I develop the thoughts. Experiences apply ing an XP-like model to a (building) architecture project. If estimation is harmfulâ�¦ then, whatâ��s not? Alistair Cockburn on the rationale for aplpying ideas and approaches from Lean Production to (software )engineering. I’ve spent the last two days Agile Approaches for Delivering Business Value, and feel I’ve learnt a lot. Here are my initial reflections on the conference. Firstly, there are a lot of very smart people thinking about these issues – it was thoroughly enjoyable to have to take on so many ideas in such a period of time. The second thing that stood out was that most of the people at the conference were involved with the development / supplier side of the IT equation. Hardly surprising, but it does mean that some of what was covered was of particular relevance for the “supply side”. However pretty much every topic had things which can be of use from the customer perspective. Thirdly, a number of people are applying thought to the problems in getting the benefits of Agile in multi-party environments, and how to support the process with appropriate contracts. It’s in everyone’s interest that there should be consensus on how to reliably deliver software projects, and how to assess the risk of such delivery (and I don’t mean CMMI) – if we can get to that, then there is more opportunity to deploy financial engineering (e.g. Graham Oake’s idea of completion bonds) to facilitate business improvements through software. There are clear lessons about the importance of getting a common view of risk between project participants. DSDM/Atern doesn’t seem to have much visibility yet outside the IT world, but looks worthy of further investigation. Last but not least, Agile is not just for software (nice to see other people have spotted this to!). How could we use a Acceptance-Test-Driven approach from the customer side? I need to reflect on, document and develop the work we have been doing on using agile approaches for such things as business analysis / programme shaping etc. Finally, thanks for thought-provoking conversations to Rachel Davies, Graham Oakes and Antony Marcano. Whilst working at EasyNet, David modified their normal XP iteration cycle to insert a phase where, for each story, acceptance test criteria were agreed and documented. Alongside this their testing harnesses were adapted to provide autoamted testing of acceptance tests wherever possible. A key enabler was to separate out test case definition (which depends on the business requirement) from test scripting (which is dependent on, and coupled with, the system under test). The technique adopted was to build test fixtures which interfaced between the (HTML) test cases and the system under test. This way the test cases can stay unchanged whilst the system changes. If the system changes in a way that breaks the test fixture that shows up as broken acceptance tests. The tool is released as Concordion. Good write up on that site. DSDM Atern: The next step in agile! Latest iteration of DSDM – much more aimed at being a generic project management method rather than IT-specific. Often used as a wrapper around Scrum and XP to scale them. Outsourcing is common for software development, and is the context for many projects using agile development processes. This paper presents two case studies concentrating on the customer role in projects using outsourcing and extreme programming (XP). The studies follow an interpretive approach based on in-depth interviews, and suggest some tensions between some contractual arrangements in outsourcing, and the XP process. In particular, one suggests XP worked well in the context of their particular outsourcing arrangements, and the other study suggests difficulty in aligning XP with a different set of outsourcing arrangements. Method – two interpretative in-depth case studies. Multiple perspectives via semi-structured interviews. Validated data and interpretation with each interviewee. KiwiCorp (customer), DevCorp (outsourcing/software house), BureauCorp(facilities management and infrastructure). 15 months, 11 people. Seen as a success. Customer saw benefit from the XP process. DevCorp project manager recognised that on fixed price would have had to be harder on the client. Lots of vendor issues because of differences between DevCorp and BureauCorp. Project Pinta. Custom-build, fixed price. FalconCorp (US developer), RetailCorp(UK retailer), ManageCorp (big consulting organisation who hired FalconCorp to do the job). FalconCorp to take the cusotm build and sell as a project. Everyone thought it was doomed… 6 month deadline. In 2 weeks ramped up to 60 people over four XP labs. Weekly iterations. So within a month knew it wouldn’t fly. FalconCorp felt that as fixed price very little room to move, so moved more to waterfall… Stopped asking questions, to make sure they could just get signoff and the cheque. Kicked the customer rep (ManageCorp) out of the lab – seen as being a “spy”. Got to 6 month demo – and custoemr accepted it! (the demo didn’t show the broken bits…). FalconCorp went into bug-fix mode and laid off 2/3 the staff. Then new management came in and found that actually the product was full of holes. Treated it as a throwaway prototype, and went into a fixed-price waterfal project to re-engineer as a saleable product. Q: How do you sell Agile to your client? Q: What are the client drivers for fixed price? A: All of them (internally) as a delivery engine. Q: Why does the industry encourage under-bidding? Square peg: Agile processes flex scope freely and have open-ended timescales. Round hole: Fixed-price contracts usually come with a deadline and strict limits on how much scope change can occur – often none at all. Luckily you don’t have to hit agile particularly hard to make it fit, while being internally agile gives the fixed-price supplier some interesting options. In this presentation we’ll explore the value of those options and what has to change for agile to work in a fixed-price world. Can IT Projects be Insured? In the movie industry, the people financing new productions can buy “Completion Bonds” – effectively insurance policies that repay their investment if the film isn’t completed on time and in line with the original proposal. Such bonds cost perhaps 2-6% of the total production budget. Could we do the same for IT projects? Where have they come from; what are they; what is their future? Report on the vision created during the Agile Alliance Functional Test Tools Visioning Workshop, which included Ward Cunningham, Brian Marick, Jim Shore, Elisabeth Hendrickson and the presenter, Antony Marcano. Delegates will be encouraged to discuss these ideas and suggest some of their own. Tests based on examples lead to an exploration of the problem space that discovers requirements and provides a foundation for trapping defects. Not a developer, never have been, never will be. Not a techie! But have worked in testing (of various sorts) for 28 years. Focus is product, and quality. What does quality really mean? How does it affect the business? How can we measure it? Rachel Davies, Agile Experience Ltd.
Scrum is the simplest possible agile method so it’s easy to get started with a small team of software developers. What happens when you try to apply Scrum to large projects? This talk shares experiences of working with large projects with multiple scrum teams and distributed scrum teams. Come to this talk to explore how to scale Scrum without losing the essence. One school of thought is that good leaders make a big difference to the successful outcome of any initiative. On the other hand, some agilists want to eliminate leaders and go with situational leadership and self-organising teams. There is also a large contingent in the agile community with the view that the right approach is to change the style of leadership, not to eliminate leaders. This interactive workshop will explore the workings of an agile team and attempt to identify the issues and approaches to leadership styles that support an agile environment. This will be fun, informative – and there may even be prizes! Will have to think about how to transcribe this! Case Study: Agile – Why Should Your Business Care ? Agile – Why Should Your Business Care? What does my business want from Agile ? Consolidating gains and driving more change. Standard Life’s award-winning use of Agile techniques is helping it achieve remarkable levels of productivity from its application development spend, and is supporting the positioning of technology provision at the heart of its business proposition. This session will cover the importance of linking your Agile enablement strategy to the needs of your business, and the challenges created by trying to change processes and beliefs that have been in place for many years. While the benefits of taking an Agile approach to the heart of the software development cycle are becoming increasingly recognised, this people-centric, communication-oriented, test-driven way of working is also powerful in helping teams and organisations early in the evolution of a idea or proposition. In this case study we look at applying an Agile way of working to the analysis of a new business idea at its inception – this includes the creation and iteration of key deliverables (financial model, project roadmap, core processes and usage scenarios) to allow a go / no-go decision. What is role of business analyst in an agile organisation? Apply agile software approach to evaluating business propositions. New business idea – challenge to validate within limited time and funds. e.g. what could be done in a week? Objective – Prepare a Pitch, based on a clearer definition of the proposition, e.g. 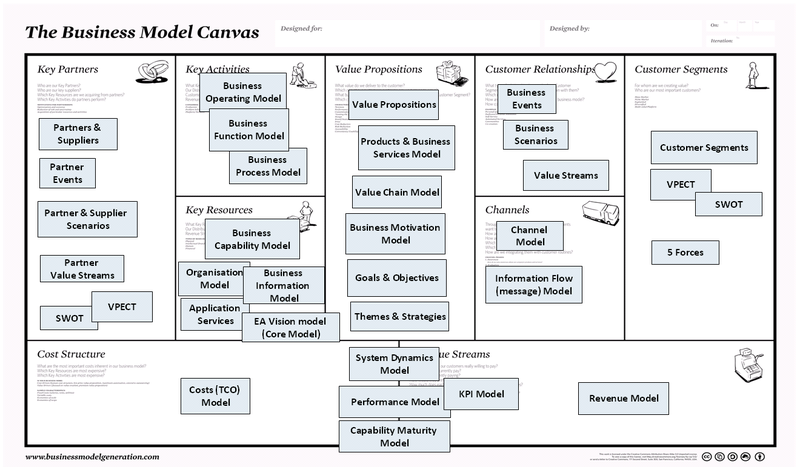 : financial model, key processes and goals, capacity model, customer scenarios, development roadmap for the business. Small team – two consultants plus client. 1 week – each day based on two Action-Reflection cycles – 2 hr workshop, consolidate, 2 hr workshop, consolidation. Models: traditionally use lots words of words to drive out ambiguity – but words are slippery! Important to facilitate a feedback-driven iteration towards consensus of the stakeholders. Use lots of visual models. Started with finances – costs, revenues… A very quick ballpark analysis. Over the 5 days about 1.5 days on this. Processes, roles and goals – the core of what the business does. Imagine a “day in the life”. Capacity model – what resources needed to deliver the service? Service development roadmap – how does the business grow? Customer scenarios – what will it be like for a customer to use the service? Lots of Post-Its and pictures! Put client in position to pitch to prospective investors and customers with supporting information, and brought to life with the scenarios. The output had a positive reception! Co-location of the team was vital – and if you aren’t, you can’t have a virtual beer together! (relationships vital). This presentation describes the ten golden rules that will increase the chances of success, and make the difference between an “OK” project and an “excellent” project. The golden rules also highlight what NOT to do. Keith Richards – process/method consultant, specialising in Agile projects. Author of “Agile Project Management” (TSO). Led team for DSDM Atern. One more day? NO! We’ll catch up NO! If you can’t understand the rationale for doing a project you shouldn’t be doing it! Expect to spend half a day writing the <10 words. ALWAYS have project reviews! Kaizen is vital. Facilitation and influencing skills are core competencies for Agile projects – especially for the project manager. Try the 10 second silence when getting a progress update! Continuously manage external risks – be “a bit of a worrier” – actively manage your risk log! Time focus is your greatest weapon. Force the issue – timeboxes, not milestones. If you are going to fail, fail early. Never extend deadlines. Case Study: Agile – Why Should Your Business Care? Update – my initial learning reflections on the conference. I’m planning to attend Agile Approaches for Delivering Business Value next week. It looks like an interesting set of sessions, and although I doubt I’ll be liveblogging, I aim to post some notes here as soon afterwards as I can. “When XP Met Outsourcing” by Angela Martin. In my current environment almost all our systems development is carried out by suppliers in various contractual models, and I’ve hit some frustrations in getting acceptance of Agile methods. I’m keen to learn how others may have constructed a “win-win” in this sort of situation. 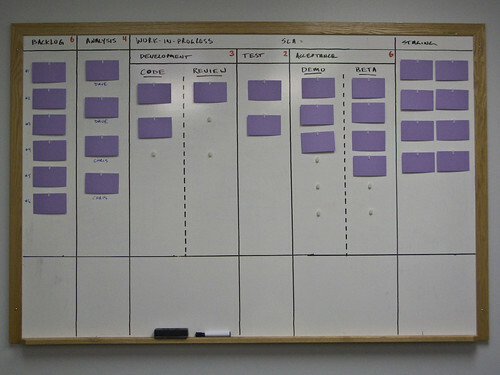 Wayne Allen documents the start of an experiment to move an agile development team onto a kanban-based, non-iterative workflow. Brad Appleton has assembled a great collection of links to resources about scaling-up agile methods to the programme management arena. Via Brad Appleton‘s excellent post of links to Agile Programme Management resources, a paper on Combining Agile Methods with Stage-Gate Project Management. Based on studies in three engineering companies, the conclusion is that are benefits from both the management and engineering perspective. Stage-gate approach improves ability of agile methods to interact with other engineering teams, other functions (such as marketing) and senior management. Overview of development methodologies and project management techniques commonly used.